The Winter 2010 photo came to us courtesy of Marty and Jim Cooney, who are both in the photo. Hugh Gallagher, who is in the photo along with his brother Jack and his father Frank, located the photo for us. The photo depicts the Cleveland Shamrocks at the 1941 Western Amateur Final, which they unfortunately lost, 2-1. 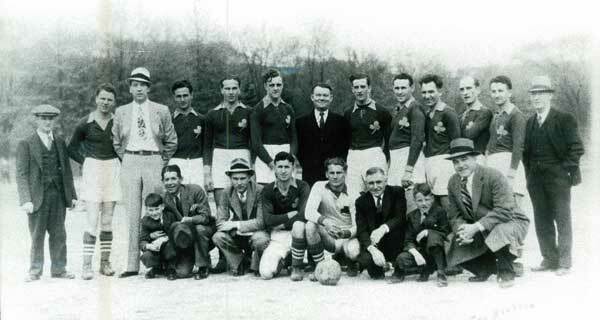 The Shamrocks played both Gaelic Football and soccer. They were managed by Frank Gallagher who operated their club headquarters. The photo includes (standing) Tom Worsley, John McKenny, Art Pilken, Julius Balough, Bill Wodowitz, James Cooney, Frank Gallagher, Martin Cooney, Pete McLaughlin, Blacky Gardner, Frank Newell, John Reiner?, (kneeling), Jack Gallagher, Mike McLaughlin, Jim Steel, Marty McLaughlin, John Wodowitz, ?, Hugh Gallagher, Tony McGinty?